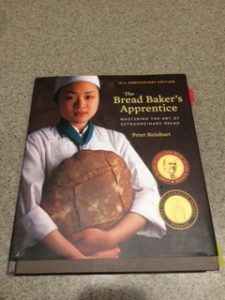 My amazing husband bought me two more advanced bread making books for Christmas. 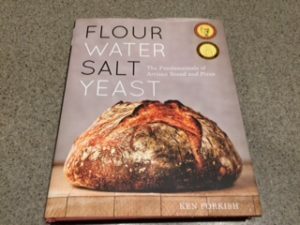 He gifted me Flour, Water, Salt, Yeast by Ken Forkish and The Bread Baker’s Apprentice by Peter Reinhart. I’m not sure his motives were completely pure, as he really like the benefits of having lots of fresh baked bread in the house. 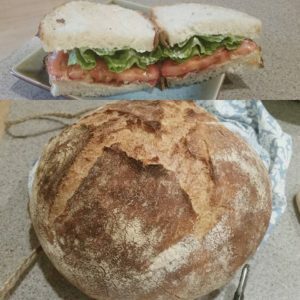 Either way, I am thoroughly enjoying reading through the wisdom of Ken Forkish and Peter Reinhart, trying out some new bread recipes, and learning new tips, tricks, and techniques along the way. I couldn’t wait to start baking, so the first loaf I tried my hand at (seriously tried my hand at, the breads by Forkish are all mixed purely by hand) was The Saturday White Bread. 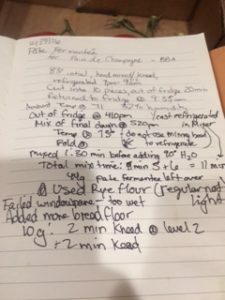 This bread recipe introduced me to using volumetric measurements, all done using a scale I received for Amazon review. 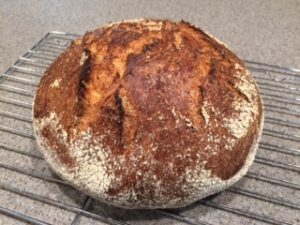 Although this bread turned out great, and made my very pregnant neighbor go “coo coo for cocoa puffs”, I found that I needed to invest in some more tools of the trade to really get the best bread. This has been especially true since I’ve started doing bread doughs made with pre-ferments. The next bread I started the same day as The Saturday White bread was Reinhart’s Pain de Campagne using a pate fermentee overnight refrigerated pre-ferment method . 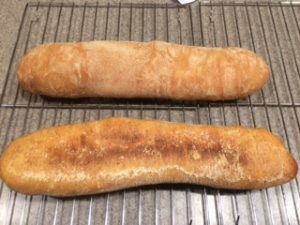 For these loaves, I documented EVERYTHING, and have to say that I learned a lot, but did not enjoy the process of having to take so many measurements. I think I disliked the data collection as it reminded me too much of my actually profession in the medical laboratory and was less about being a creative outlet. These loves were my British mother in laws favorite, but I struggled with shaping the loaves. 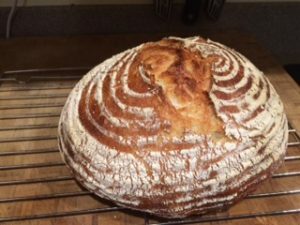 In Flour, Water, Salt, Yeast, all loaves are shaped into a round boule to be baked in a 4 quart dutch oven, so shaping the loaves for Forkish’s recipes is much simpler. But practice makes perfect, so I will keep baking and shaping until I get it right…maybe with a little help from one of my best friends who happens to be a pastry chef! 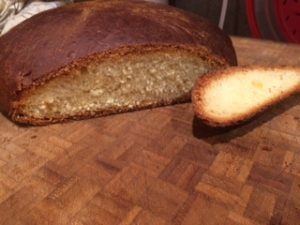 The third loaf I mixed up was once again from Reinhart, a Portuguese Sweet Bread. It was okay, but not like the crusty and full of flavor rustic breads I had been making and craving. This was more of a brioche like bun dough, and would taste great made into cinnamon rolls, or similar buns because of the sweet citrus flavors of the dough. I did get to use my Kitchenaid mixer for this dough though, and that reminded me of when my husband bought it for me 7 years ago for Christmas and how far my bread making skills have improved. The last 2 loaves I tried my hand at were Harvest Bread with Poolish and White Bread with Poolish. For the latter loaves, I had some of my new tools in, and was able to raise these in cane banneton proofing baskets. Although the loaves I previously proofed in a large metal bowl lined with a flour dusted tea towel didn’t taste differently, it was less of a flour mess, the loaves had a more uniform shape, and the proofing baskets gave the loaves a more professional appearance with the flour rings. Baking these loaves in the 4 quart dutch oven give them such a nice crispy crust that I was never able to achieve just using my large rectangular pizza stone. I’m pretty sure my family and friends have been enjoying my Christmas gifts as much as I have. I’ve baked 10 loaves of bread in the past week, so there have been a lot of bread deliveries. 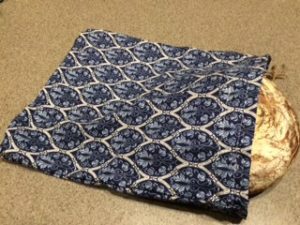 My mother in law sewed me up some cute fabric bags to deliver the bread so that the hot out of the oven loaves can still let off steam but still be protected for travel. 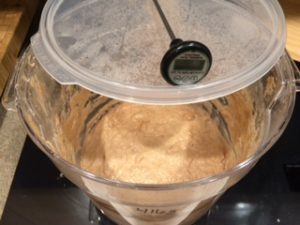 Currently, I am working on a levain starter…think less “sour” sourdough. It uses naturally occurring yeast to raise the bread and the final loaves can be baked without adding any commercial yeast. Husband’s co-workers have pretty much demanded some fresh baked bread, so I plan to mix up Forkish’s Field Blend #2 to deliver them hot out of the oven along with some good quality butter to schmear (Southwestrn Pennsylvanina for smear or spread) over the cracks and crevices of these naturally risen loaves. The levain will be ready to bake with in 2 more days…but I doubt I can go that long without baking up another batch of bread because I mussgo bake! I find working with my hands very therapeutic and stress relieving, which I definitely noticed this week when I was baking as the notary was here for us to try for a second time to sign our home loan refinancing documents. With all that hassle behind me, I will continue to keep calm and bake bread!